Purpose of Wildlife Management Area: Management of critical habitat for waterfowl, shorebirds, raptors, songbirds and small mammals. On the south arm of the Fraser River, north of Ladner in the City of Richmond. The WMA provides important nesting, feeding, loafing and wintering/staging habitat for waterfowl and other wetland-dependent species. This area supports the highest densities of waterbirds and shorebirds in Canada, and more waterfowl winter in this area than the rest of Canada combined; it has been estimated that as many as 1.4 million birds may use this area annually. The Boundary Bay, Sturgeon Bank and South Arm Marshes Wildlife Management Areas have been internationally designated as Western Hemisphere Shorebird Reserve Network sites. Common species include the Snow Goose, Green-winged Teal, American Wigeon, Northern Pintail, Great Blue Heron, Northern Harrier, Goldeneye, Ruddy Duck and Bald Eagle. The aquatic component of the WMA provides important habitat for many nearshore and freshwater fish species. Young Spring, Pink, Chum and Chinook utilize the tidal marsh and channels, sometimes for up to two months. 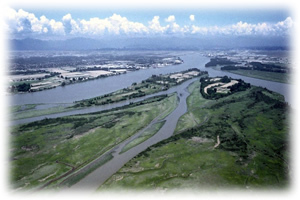 This area is part of the Fraser River delta, and is made up of tidal wetlands, mudflats, drainage channels and uplands. Over 80% of the total area is undyked tidal floodplain. The intertidal areas include Woodward, Duck and Barber Islands, other unnamed islands located among these islands, Ladner Marsh and Ladner Lagoon. Upland areas include the dyked Kirkland/Rose Islands, Williamson and Gunn Islands, and the cottonwood forest at the north end of Ladner Marsh. Rare plant elements appearing in the WMA include Hendersons Checker-mallow, Rice Cutgrass, and Western St. John’s Wort. Management Planning not available at this time.